All the Java code for the project is available in Github – requires Maven to run. See the README for more details – link here. Imagine a complex enterprise infrastructure, running a bunch of different systems, servers and technologies, with data flowing between them all. Commonly there will be some sort of Messaging system in play – handling routing and transformation of the various message flows. In our example we have ApacheMQ as the Messaging Server. The endpoints of some of these flows may be to send data to multiple clients. One way to do this is to route messages to a Topic, and have many clients subscribed to that topic – this is easy of the clients are Java, but not so easy if the clients are Browsers. Typically browser clients will have to use a hand rolled polling approach to check for new data being available. 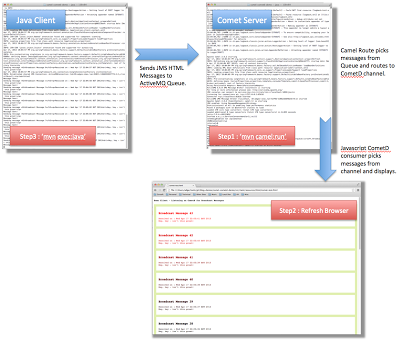 The demo shows HTML messages being sent to an ActiveMQ JMS Queue, from where they are picked up by Camel and then routed to a CometD channel endpoint. 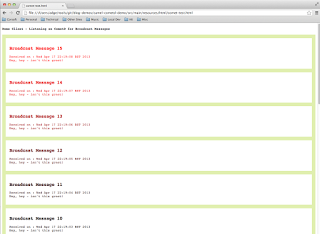 A HTML page consumes messages from the CometD channel – and as they are received, adds them to a list on the web page. 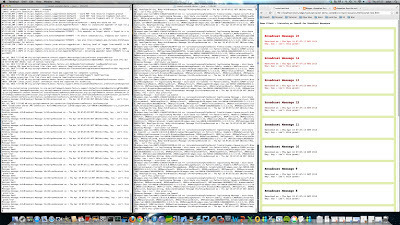 An example of the HTML page is shown below (I’ve added some JQuery to initially flash the images in red, and then fade them out to black over time – just to make it obvious as new messages arrive). The messages are just simple, generated automatically from a Java client app, which pushes them to ActiveMQ using a Spring JMSTemplate. Obviously this is a pretty simple demo – in a real world situation you may not want to be sending raw HTML down the channel. A better solution would be JSON, allowing the client to extract and format how it wanted to.